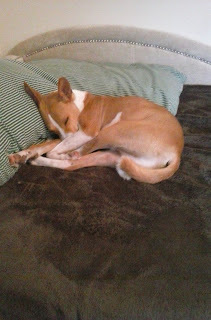 Work has been a little busier than usual and we have been distracted this week by the odd behavior of our Basenji, DJ. He was diagnosed yesterday with a renal disease common to Basenjis called Fanconi syndrome. It is no longer fatal, but also not curable and we are working on a protocol with our vet while also dealing with some worrying symptoms. I hope to be back in a week or so when I can give my blogging and research my full attention. Best wishes for DJ's health, Anna. A beautiful dog, and much-loved, I'm sure. Basinjis are interesting dogs. Take the time you need.